Bethel Crematorium Applicant McLoughlin Submits Two More Civil Suits Against P&Z and CT Coining Inc. It seems the Bethel crematorium applicant B. Shawn McLoughlin is still fighting to get his crematorium business in Bethel’s Clarke Business Park. This quest is despite the Bethel Planning & Zoning Commission denying all his applications on September 22, 2015, and also banning this type of business completely in Bethel. Photo above: A Planning & Zoning Commission “work session” meeting in the CJH Municipal Center in Bethel, about the crematorium, on September 8, 2015. McLoughlin also has a new attorney, Daniel Casagrande of Cramer & Anderson LLP in Danbury, CT.
McLoughlin and his company Mono-crete Step Co. LLC, a cement products company located on the same property, filed two new lawsuits against the Bethel Planning Zoning Commission (P&Z) on October 13, 2015, one of which also includes Connecticut Coining Inc. named as a second defendant. 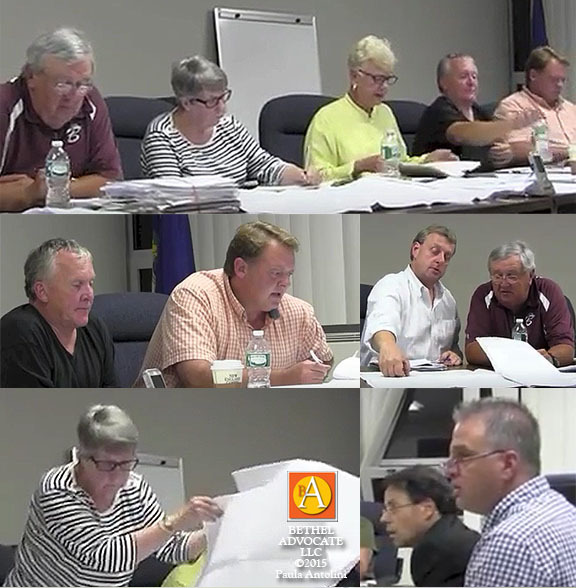 CT Coining Inc. is the business next door to the proposed crematorium location and it’s owner, Greg Marciano, previously filed several requests with the P&Z for a moratorium and text changes, and these requests were approved. McLoughlin is seeking a reversal of the decision of the second text amendment (amendment of the first amendment) which was basically a reversal of the first text amendment approved by the P&Z in 2014, which then allowed a crematorium in Clarke Business Park and all IP Zones. This is the amendment that started this whole process in motion. Previous to this approval, crematoriums were not allowed in Bethel’s IP Zone. McLoughlin is seeking to have the first text amendment decision remain, to allow crematoriums in Bethel’s IP Zone. McLoughlin is seeking reversal of several other P&Z decisions, where they denied approval of a site plan/building special permit, a special permit for land use, a moratorium banning crematoriums, and a text amendment that eliminated the crematorium text completely. 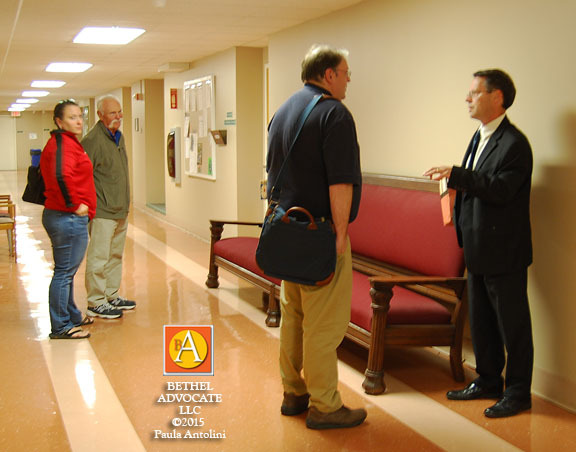 Photo above: B. Shawn McLoughin (2nd from left) and daughter Shelby McLoughlin (far left) in the CJH Municipal Center hallway after the P&Z voted to deny all crematorium applications on September 22, 2015. On the far right is Attorney Charles Andes, counsel for the P&Z who is chatting with Attorney Peter Olsen (2nd from right), McLoughlin’s lawyer. On October 13, 2015, Plaintiff McLoughlin, who wants to build a crematorium at 12 Trowbridge Drive in Bethel, CT, filed a civil suit in the State of Connecticut Superior Court in Danbury, case number DBD-CV15-6018264-S, “MCLOUGHLIN, B. SHAWN v. PLANNING & ZONING COMMISSION OF THE TOWN OF BETHEL Et Al” which also named Connecticut Coining Inc. (the business at 10 Trowbridge Drive in Bethel, CT) as defendant #2, whose attorney is Neil Marcus of Cohen & Wolf in Danbury, CT. The return date for the defendant is November 24, 2015. Such other relief as law or equity may apply. A judgement of the Court reversing the decision of the Commission and directing the Commission to approve the Location Application. A judgement of the Court reversing the decision of the Commission and directing the Commission to approve the Amendment Application and Moratorium Application. The scheduled court date is a conference scheduled for 9:30 a.m. on November 2, 2015. I just want to tell you that I am just beginner to blogging and site-building and really liked your blog. Likely I’m going to bookmark your blog . You actually come with remarkable article content. Thanks a lot for revealing your blog. cost a pretty penny? I’m not very internet savvy so I’m not 100% positive. by reading such nice articles. learn where you got this from or exactly what the theme is named. Very nice post. I just stumbled upon your blog and wished to say that I have really enjoyed surfing around your blog posts. a most excellent web page for most recent updates. I say to you, I certainly get irked while people think about worries that they just do not know about. was almost moved to start my own blog (well, almost…HaHa!) Great job. out of date rehashed information. Fantastic read! very informative posts at this time. for enjoyment, since this this website conations really pleasant funny stuff too. websites on the net. I am going to highly recommend this website! I have fun with, lead to I found exactly what I was looking for. Your website provided us with useful info to work on. You have performed a formidable task and our entire community will likely be grateful to you. any other web site which presents these data in quality? site daily, this web page is really good and the viewers are really sharing fastidious thoughts. This is my first time pay a visit at here and i am truly impressed to read all at alone place. but I by no means discovered any interesting article like yours. the net might be much more useful than ever before. comment is added I get 4 emails with the same comment. website and I’d like to find something more secure. Do you have any solutions? With havin so much content and articleswritten contentcontent do you ever run into any problemsissues of plagorism or copyright violationinfringement? My websitesiteblog has a lot of completely uniqueexclusiveunique content I’ve either authoredcreatedwritten myself or outsourced but it looks likeappearsseems a lot of it is popping it up all over the webinternet without my agreementauthorizationpermission. Do you know any solutionstechniquesmethodsways to help protect againstreducestopprevent content from being ripped offstolen? I’d certainlydefinitelygenuinelytrulyreally appreciate it. Hello very cool site!! Man .. Excellent .. Wonderful .. I will bookmark your web site and take the feeds additionally¡KI am happy to seek out numerous helpful information here within the put up, we’d like develop more strategies in this regard, thank you for sharing. . . . . .
Well I sincerely liked studying it. This subject provided by you is very useful for proper planning. You made some clear points there. I did a search on the issue and found most individuals will consent with your website. Hi there, You have done an excellent job. I will definitely digg it and personally suggest to my friends. I am sure they will be benefited from this website. Thanks for all of the labor on this site. Gloria enjoys setting aside time for internet research and it’s easy to understand why. Almost all hear all of the compelling means you create very helpful tricks via this blog and boost response from some other people on the area of interest so my simple princess is without a doubt being taught a lot of things. Enjoy the remaining portion of the new year. You’re carrying out a powerful job. I would like to thank you for the efforts you have put in writing this web site. I am hoping the same high-grade web site post from you in the upcoming as well. Actually your creative writing abilities has inspired me to get my own blog now. Really the blogging is spreading its wings fast. Your write up is a great example of it. Simply wish to say your article is as amazing. The clearness in your post is simply great and i can assume you are an expert on this subject. Well with your permission allow me to grab your RSS feed to keep up to date with forthcoming post. Thanks a million and please carry on the enjoyable work. Howdy very nice site!! Guy .. Beautiful .. Amazing .. I’ll bookmark your site and take the feeds also¡KI am satisfied to seek out numerous useful information right here in the publish, we’d like work out extra techniques in this regard, thank you for sharing. . . . . .
Hi there, just wanted to say, I liked this article. Wow, wonderful weblog structure! How long have you ever been blogging for? you made running a blog glance easy. The whole look of your web site is magnificent, as well as the content material! I’ll immediately seize your rss feed as I can not to find your e-mail subscription link or e-newsletter service. Do you have any? Please let me know so that I may just subscribe. me know if this okay with you. Regards! I don’t even know how I stopped up here, but I thought this put up used to be great. a well-known blogger if you happen to are not already. Usually I do not learn article on blogs, but I would like to say that this write-up very forced me to try and do so! Your writing taste has been amazed me. Thank you, quite great article. Hello.This post was really motivating, especially since I was searching for thoughts on this subject last Saturday. Somebody necessarily help to make significantly articles I might state. to create this particular publish amazing. I have been examinating out a few of your posts and i must say pretty good stuff. I will surely bookmark your website. going to let know her. I¡¦ve been exploring for a little for any high quality articles or blog posts on this sort of house . Exploring in Yahoo I at last stumbled upon this web site. Reading this information So i¡¦m satisfied to show that I have a very excellent uncanny feeling I came upon just what I needed. I so much definitely will make certain to do not overlook this web site and give it a look on a relentless basis. Well I definitely liked reading it. This post offered by you is very helpful for accurate planning. I think other site proprietors should take this web site as an model, very clean and fantastic user genial style and design, let alone the content. You’re an expert in this topic! I have been examinating out many of your articles and it’s pretty nice stuff. I will surely bookmark your website. I would like to thnkx for the efforts you have put in writing this web site. I am hoping the same high-grade blog post from you in the upcoming as well. Actually your creative writing skills has inspired me to get my own website now. Actually the blogging is spreading its wings quickly. Your write up is a good example of it. Great goods from you, man. I’ve understand your stuff previous to and you’re just extremely great. I really like what you have acquired here, really like what you’re saying and the way in which you say it. You make it entertaining and you still take care of to keep it wise. I can not wait to read much more from you. This is actually a wonderful website. got the courage to go ahead and give you a shout out from Porter Texas! minutes and actual effort to generate a top notch article… but what can I say… I procrastinate a whole lot and never seem to get nearly anything done. I was recommended this web site by my cousin. I’m not sure whether this post is written by him as nobody else know such detailed about my difficulty. I have to voice my admiration for your kindness supporting men and women who require guidance on your theme. Your real commitment to passing the solution up and down became exceedingly practical and has in most cases helped women just like me to achieve their desired goals. Your own helpful tutorial implies a lot a person like me and additionally to my colleagues. Thank you; from all of us. Definitely, what a magnificent website and illuminating posts, I definitely will bookmark your blog.Have an awsome day! Whats Happening i’m new to this, I stumbled upon this I’ve discovered It absolutely helpful and it has helped me out loads. I’m hoping to contribute & help different users like its aided me. Great job. Magnificent goods from you, man. I’ve understand your stuff previous to and you’re just extremely wonderful. I really like what you have acquired here, really like what you are stating and the way in which you say it. You make it entertaining and you still take care of to keep it sensible. I can’t wait to read much more from you. This is really a wonderful site. Someone necessarily assist to make critically posts I’d state. This is the first time I frequented your website page and up to now? I amazed with the analysis you made to make this particular publish incredible. Excellent activity! Wow, incredible blog layout! How lengthy have you been running a blog for? you made blogging glance easy. The full look of your site is fantastic, as smartly as the content material! Everyone loves what you guys are up too. Such clever work and exposure! Keep up the amazing works guys I’ve added you guys to my blogroll. I have read some good stuff here. Definitely worth bookmarking for revisiting. I wonder how much effort you put to create this type of magnificent informative site. Thank you for some other informative website. The place else may just I am getting that kind of information written in such a perfect way? I’ve a project that I am just now running on, and I have been at the glance out for such information. Hello. magnificent job. I did not expect this. This is a great story. Thanks! Someone essentially lend a hand to make significantly articles I might state. This is the very first time I frequented your website page and up to now? I amazed with the research you made to create this particular submit incredible. Excellent job! Hey, you used to write great, but the last few posts have been kinda boring¡K I miss your great writings. Past several posts are just a bit out of track! come on! Someone necessarily assist to make severely articles I’d state. That is the very first time I frequented your web page and so far? I surprised with the research you made to create this actual put up amazing. Great process! I would like to thank you for the efforts you’ve put in writing this blog. I’m hoping the same high-grade blog post from you in the upcoming as well. Actually your creative writing abilities has encouraged me to get my own site now. Really the blogging is spreading its wings rapidly. Your write up is a good example of it. Howdy there, just became familiar with your blogging site through yahoo, and have found that it is quite interesting. I will be grateful for in the event you retain this post. You should be a part of a contest for one of the greatest sites on the internet. naturally like your web-site but you need to check the spelling on several of your posts. Several of them are rife with spelling issues and I to find it very troublesome to inform the truth however I¡¦ll certainly come back again. I precisely wanted to thank you so much once again. I’m not certain the things I would have carried out without the actual tactics contributed by you regarding this problem. It was actually the depressing condition for me personally, but taking a look at your expert fashion you treated the issue took me to jump over gladness. I will be happier for your support and wish you really know what an amazing job that you’re undertaking instructing people with the aid of your blog. Most probably you have never met any of us. I needed to compose you a tiny remark in order to thank you very much the moment again considering the beautiful tips you’ve discussed at this time. It has been incredibly generous with you to provide extensively just what a lot of people would’ve offered for sale for an e book in making some money for themselves, especially seeing that you might have done it if you ever desired. The guidelines as well acted to be the good way to recognize that other individuals have the identical eagerness just like my very own to find out more and more with regard to this issue. Certainly there are lots of more pleasant periods ahead for those who scan through your blog. Hi there very nice web site!! Man .. Excellent .. Wonderful .. I will bookmark your website and take the feeds additionally¡KI’m happy to search out a lot of useful information right here within the publish, we need work out more techniques on this regard, thanks for sharing. . . . . .
Well I definitely enjoyed reading it. This article offered by you is very practical for correct planning. It¡¦s actually a nice and useful piece of information. I am satisfied that you just shared this useful info with us. Please keep us informed like this. Thanks for sharing. As I web-site possessor I believe the content material here is rattling wonderful , appreciate it for your hard work. You should keep it up forever! Best of luck. This is the right web site for anyone who hopes to find out about this topic. You know so much its almost hard to argue with you (not that I personally would want to…HaHa). been discussed for many years. Excellent stuff, just wonderful! Thanks a lot for providing individuals with an extremely nice chance to read critical reviews from this website. It is always very great and also stuffed with a lot of fun for me and my office friends to visit your site minimum thrice in a week to learn the fresh secrets you have got. And of course, we’re usually astounded with your striking things you give. Some 1 facts in this posting are surely the best I have ever had. Hello there, just became aware of your blog through Google, and found that it is truly informative. I am going to watch out for brussels. I’ll appreciate if you continue this in future. Numerous people will be benefited from your writing. Cheers! Pretty section of content. I just stumbled upon your website and in accession capital to assert that I acquire actually enjoyed account your blog posts. Anyway I’ll be subscribing to your augment and even I achievement you access consistently rapidly. Hello.This post was really motivating, particularly since I was investigating for thoughts on this issue last week. This is really interesting, You are a very skilled blogger. I’ve joined your feed and look forward to seeking more of your magnificent post. Also, I’ve shared your web site in my social networks! We’re a group of volunteers and opening a new scheme in our community. Your web site offered us with valuable information to work on. You’ve done a formidable job and our entire community will be thankful to you. Hi there, You have done a great job. I’ll certainly digg it and personally recommend to my friends. I am sure they will be benefited from this web site. the issues. It was really informative. Your website is very helpful. Thanks a lot for providing individuals with an exceptionally superb chance to read critical reviews from here. It is usually so useful and as well , packed with a good time for me and my office acquaintances to search your blog more than thrice in 7 days to study the newest guides you have. Not to mention, I’m so actually satisfied with your mind-boggling tips you give. Certain 1 ideas in this posting are in fact the most beneficial I’ve had. A person necessarily help to make seriously articles I would state. This is the first time I frequented your website page and up to now? I surprised with the analysis you made to create this particular put up extraordinary. Magnificent task! Wow! Thank you! I permanently wanted to write on my website something like that. Can I take a part of your post to my site? It¡¦s really a nice and useful piece of info. I am glad that you shared this helpful information with us. Please stay us up to date like this. Thanks for sharing. I was suggested this website by my cousin. I’m not sure whether this post is written by him as no one else know such detailed about my trouble. You’re incredible! Thanks! It¡¦s actually a nice and helpful piece of info. I am happy that you shared this useful info with us. Please keep us up to date like this. Thanks for sharing. afterward i suggest him/her to pay a visit this website, Keep up the pleasant job. far added agreeable from you! By the way, how can we communicate? you might be interested in hearing. Either way, great blog and I look forward to seeing it improve over time. Thank you a bunch for sharing this with all people you really understand what you’re talking about! Bookmarked. Kindly additionally seek advice from my web site =). We will have a link trade agreement between us! be tweeting this to my followers! Exceptional blog and outstanding design and style. Fantastic website. A lot of helpful information here. I¡¦m sending it to some buddies ans additionally sharing in delicious. And naturally, thank you to your sweat! Hurrah! At last I got a blog from where I be able to actually get helpful facts regarding my study and knowledge. I read this piece of writing completely concerning the comparison of most up-to-date and previous technologies, it’s remarkable article. I have been absent for some time, but now I remember why I used to love this site. Thanks , I will try and check back more frequently. How frequently you update your website? My wife and i felt satisfied when Peter managed to carry out his studies out of the ideas he received from your own web page. It’s not at all simplistic to just continually be making a gift of hints that other people might have been trying to sell. We really fully understand we need the website owner to give thanks to for that. Most of the explanations you made, the easy web site navigation, the relationships you can give support to engender – it’s got everything unbelievable, and it’s really letting our son in addition to us understand that article is fun, which is certainly wonderfully pressing. Thank you for all the pieces! I’m still learning from you, as I’m making my way to the top as well. I definitely enjoy reading everything that is written on your blog.Keep the information coming. I loved it! I would like to thnkx for the efforts you’ve put in writing this blog. I am hoping the same high-grade website post from you in the upcoming also. In fact your creative writing abilities has encouraged me to get my own blog now. Actually the blogging is spreading its wings quickly. Your write up is a good example of it. I¡¦ve learn a few just right stuff here. Certainly worth bookmarking for revisiting. I surprise how a lot attempt you set to make this sort of magnificent informative web site. Hiya very nice web site!! Man .. Beautiful .. Superb .. I will bookmark your blog and take the feeds additionally¡KI’m satisfied to find numerous useful info here within the post, we need work out more strategies in this regard, thank you for sharing. . . . . .
be able to without difficulty understand it, Thanks a lot. Thanks for sharing excellent informations. Your web-site is so cool. I’m impressed by the details that you have on this site. It reveals how nicely you perceive this subject. Bookmarked this website page, will come back for more articles. You, my pal, ROCK! I found simply the information I already searched all over the place and just couldn’t come across. What a perfect website. Hello there, just became alert to your blog through Google, and found that it’s really informative. I am gonna watch out for brussels. I’ll be grateful if you continue this in future. Lots of people will be benefited from your writing. Cheers! I’ve incorporated you guys to blogroll. Good website! I truly love how it is easy on my eyes and the data are well written. I’m wondering how I might be notified when a new post has been made. I’ve subscribed to your RSS which must do the trick! Have a great day! Hi, Neat post. There’s an issue with your website in internet explorer, might check this¡K IE nonetheless is the marketplace leader and a good component of other folks will leave out your magnificent writing because of this problem. I have to express some appreciation to the writer for bailing me out of this matter. Because of searching through the online world and meeting solutions which are not productive, I assumed my entire life was over. Existing without the strategies to the issues you’ve sorted out by means of your good article is a critical case, and the kind that would have in a wrong way damaged my entire career if I had not encountered your site. Your main talents and kindness in maneuvering almost everything was valuable. I’m not sure what I would have done if I had not discovered such a point like this. I can at this moment look ahead to my future. Thank you so much for this specialized and effective guide. I will not hesitate to suggest your web site to anyone who needs assistance on this situation. Pretty nice post. I just stumbled upon your weblog and wished to say that I’ve truly enjoyed browsing your blog posts. After all I’ll be subscribing to your rss feed and I hope you write again soon! There is obviously a bunch to know about this. I assume you made some nice points in features also.